This week we read the following according to the Torah, Vayikra / Leviticus 10:16-17, ואת שעיר החטאת דרש דרש משה והנה שרף ויקצף על־אלעזר ועל־איתמר בני אהרן הנותרם לאמר 10:16 Then Moses inquired about the goat of sin offering, and it had already been burned! He was angry with Eleazar and Ithamar, Aaron’s remaining sons, and said, מדוע לא־אכלתם את־החטאת במקום הקדש כי קדש קדשים הוא ואתה נתן לכם לשאת את־עון העדה לכפר עליהם לפני יהוה 10:17 “Why did you not eat the sin offering in the sacred area? For it is most holy, and He has given it to you to remove the guilt of the community and to make expiation for them before the LORD. The role of the priest in the Tabernacle was to stand in substitute (in our place) to make atonement on our behalf before God. Parashat Shemini describes the importance of the sin offering where the priest consumes a portion of the sin offering in order to bear the guilt of the people and to make expiation for them before the Lord God Almighty. Ibn Ezra states the following concerning this verse (Ibn Ezra on Leviticus 10:17 Part 1) “in the holy place at the entrance to the Tent of Assembly, as it is written [9:31]. 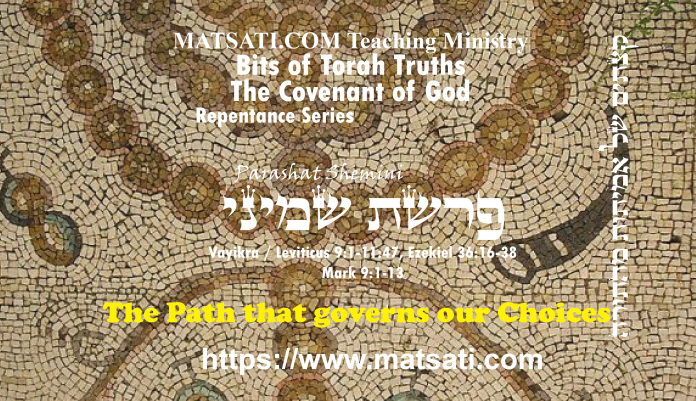 and He (God) has given it to you to pardon [literally: carry away]: When you eat the sin-offering, God will carry away the sin of the congregation; or You shall carry off the sin (meaning, their sins shall be forgiven through you — this explains the concluding clause, “to atone…”)” Rashi also states the following concerning this verse, Rashi on Leviticus 10:17 Part 3 “‘ואתה נתן לכם לשאת וגו‎ AND HE HATH GIVEN IT TO YOU TO BEAR [THE INIQUITY] etc., — for only if the priests eat it are the owners of the sin-offering (the entire Congregation in the case of the goat for the New Moon) atoned for (Sifra, Shemini, Chapter 2 4).” Moshe’s words “seeing that He gave it to you to bear the guilt of the community, and to obtain atonement for them!” describes the sacrificial animal in the case of the goat offering for the New Moon. This describes the offering that repeats itself month after month throughout the ages. The function of that offering was to obtain atonement for trespasses committed involving entering or being in the holy precincts while in a state of ritual impurity, or trespasses involving consumption of parts of such offerings which had become ritually impure for some reason after their being slaughtered. The sages interpreted this verse to refer to sins committed in connection to holiness. This is said to be involved with one’s ability to stand and face HaShem. If we are living in sin, we cannot stand before the Lord with peace in our hearts. These Scriptures teach us the Lord God of Israel cares and loves us to the extent of providing a way to draw near and make atonement by the hand of the priest. Without our High Priest (Yeshua the Messiah) it is not possible to find atonement according to God’s Word!